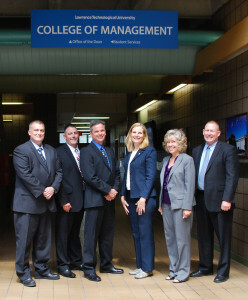 In September, the seventh cohort of senior civilian leaders working for the U.S. Army primarily at the TACOM Life Cycle Management Command headquartered in Warren started an intensive, 10-month master’s degree program in Global Leadership and Management at Lawrence Technological University (LTU). Michael Roche (right), the SSCF director at the Defense Acquisition University, joins members of the new class, (L-R) Jack Spielman, John Engbloom, Anthony Budzichowski, Marta Tomkiw, and Deborah DiCesare. The Senior Service College Fellowship (SSCF) program was created in 2007 when the Army identified civilian leadership development as a top priority and assigned the task to the Defense Acquisition University (DAU). DAU partnered with LTU to develop a leadership educational program to prepare civilian leaders in the military for the challenges of leading effectively in a global economy. The program is designed to provide civilian leaders, GS-14 and above, with the knowledge and skills that will enable them to assume senior leadership roles. “This is critically important with the pending retirement of many current senior leaders who are members of the baby-boomer generation,” said Tom Marx, the director of the SSCF program at Lawrence Tech. At the end of the program, the students receive a master’s degree in Global Leadership and Management from LTU. LTU’s College of Management has a Center for Global Leadership and Understanding, and global leadership is an important component of its MBA and doctoral degree programs. “This is a good fit since the military wants its future senior leaders to have a global perspective,” Marx said. The university’s motto of “Theory and Practice” also fits well with the military’s emphasis on practical applications for the education it provides to senior leaders. That was the personal experience of Jennifer Hitchcock, a 2009 SSCF graduate who is executive director for Research and Technology Integration at the Tank Automotive Research, Development and Engineering Center (TARDEC) in Warren, which is part of the U.S. Army’s Research Development and Engineering Command. She said the SSCF program taught her how to relate her career experiences to academic lessons about leadership, unlike many business courses that teach about leadership from books. She also found that she learned a lot from other students in the program. “They helped me understand different perspectives and the importance of seeking alternative views, as I may not always make the right decision if I am singularly looking at a problem,” Hitchcock said. Most of the 44 students who have graduated from the master’s degree program in the past six years have been civilian leaders in the Army, although a few have come from the Navy, the Air Force, and one from General Dynamics, a major military supplier. The SSCF is held to a higher standard than the typical master’s degree program, according to Michael Roche, DAU’s director of the SSCF program in Michigan. “Our volatile, uncertain, complex, and ambiguous future demands leaders who understand the economic, demographic, political, legal, social, and cultural landscape and how it is changing,” Roche said. “LTU challenges the Fellows to acquire knowledge, investigate with the right questions, discuss their views, and impose structure on their thoughts. This helps the Fellows learn how to address the opportunities and challenges of the future and shape the issues, not just react to them. As a master’s degree program at Lawrence Tech, SSCF has an intense research component, unlike other educational programs designed for civilian leaders in the military. “Our goal is to develop global thinkers and leaders who understand and know what it means to work in an increasingly connected worldwide community,” said LTU Associate Professor Jacqueline Stavros who teaches the course, Global Organization Development and Change. Stavros has found that the SSCF students bring a greater level of maturity, experience, and sense of responsibility than the typical MBA student. They are typically older and hold higher-level positions than most MBA students. Some have served in the military and bring an invaluable perspective gained in war-torn nations and peace-building efforts. “The SSCF candidates view issues more from a national-interest perspective. They clearly understand that their mission is to support American warfighters as they risk their lives to protect our country,” Stavros said.